When the 840bhp Dodge Challenger SRT Demon was launched, it was marketed as the quickest accelerating production car in the world. Unfortunately for the American company, that claim lasted only a while as faster cars soon claim that their cars can do the century sprint in less than 2.3 seconds. In an article posted by Carscoops, Dodge now even openly admits that its muscle car no longer holds this title. 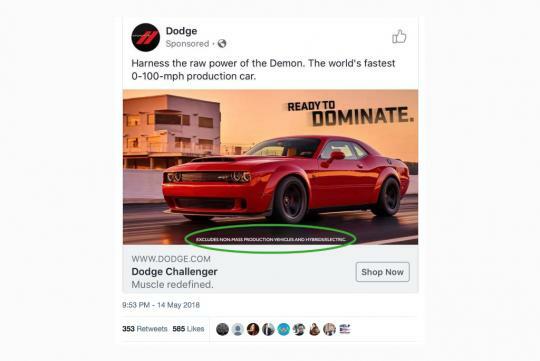 In a recent Dodge advert that appeared on Facebook, Dodge stated that the Demon is the "world’s fastest 0-100-mph production car." But upon closer look, you can see that it has a disclaimer that says "Excludes non-mass production vehicles and hybrids/electrics." With AWD and instant torque, electric vehicles have been excelling in drag races and are likely to go even faster still in time to come. Coupled with the fact that the Demon needs to be in the right settings and the right conditions with an experienced driver to replicate its sprint timing, it is only safe that Dodge published that advert with the disclaimer.